Luxury private transfers can be arranged with our reliable and professional partner company for our guests to make sure you arrive in comfort and style. All prices are fully inclusive of A22 motorway toll, all taxes and airport parking. There is a 20% surcharge for all collections between 21:00 and 06:00. Resort Rentals can make you holiday arrangements easier by handling your car hire in the Algarve too with a local reliable rental company. Their rates are inclusive of all insurances, zero excess, baby seats, 2nd driver and collection at Faro airport. Pass your requirement to us at bookings@resortrentalsalgarve.com and we will do the rest. Please note that the A22 motorway now has tolls but they cannot be paid for on the spot. The registration plate is read whenever the car drives under one of the "Gates" that are positioned along the highway and the fee is either collected by a device installed in vehicles or paid 2-5 days later via the post office (in the shop or online). When you collect a car, ask the car rental company you use what arrangements are currently in place for payment of the tolls with their firm. Arriving late? Don't start your holiday hungry book a welcome food pack! We can do the food shopping for you and deliver directly to your apartment or villa before your arrival. Send your requirements through to us at bookings@resortrentalsalgarve.com following your holiday confirmation. 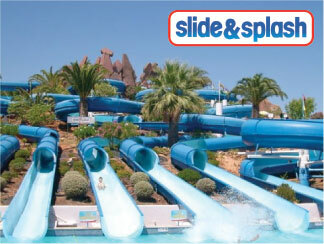 A range of theme parks and water parks available throughout the Algarve. A day at the water parks. Action, madness and great entertainment. With somersaults, acrobatic jumps, fast slides down tubes and lots of diving, a day at the water park is a sure way to have some fun and excitement. 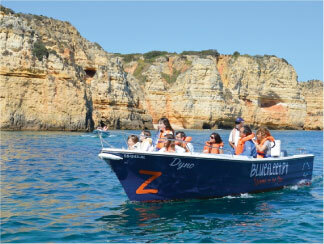 For those occasions when you feel like getting away from the routine of the beach, the Algarve has five possibilities of non-stop entertainment to offer you, all providing different ways of enjoying yourself in the water. Experience the Magic of the Dolphin show, the Tropical Bird Show with colourful Macaws, Parrots and cockatoos or the Birds of Prey. Then there's the Seal and Sea Lion Show where you can come and fly to the world of fantasy with the Magic Book. There are also Lakes and Gardens, the Aquarium Museum, Swimming Pools and Amusements to enjoy. 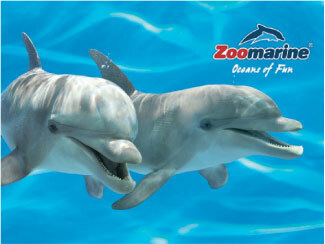 Plus experience the chance of a lifetime and Interact with the Bottlenose Dolphins. Zoomarine to be found along the main highway EN125 near Guia. 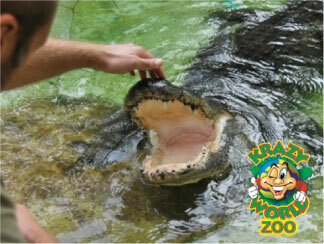 Live shows featuring reptiles, including Alligator swamp, 6m Burmese Python, Reticulated Python and Turtle Town. Also feeding of exotic animals, pony rides, two thrilling mini-golf courses (Krazy and Jungle Golf), funfair, tropical swimming pools, two quad-bike tracts, and buggies. 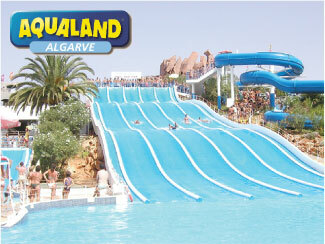 Fun for all the family in the best and largest Water Park in Portugal. Enjoy 6 hectares of family fun to occupy you for the whole day. Try the rides from the thrilling Banzai Boggan gliding down 23 metres of sheer excitement to having a go on the Kamikaze, a 92 metres bi-slide! A huge complex of water chutes, slides and swimming pools to keep even the most reluctant of water-babies amused. Slide & Splash Situated along the EN 125 near Estombar, Lagoa. 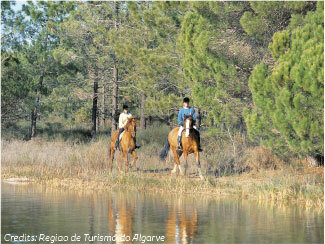 What better way to see the Algarve countryside than from the back of a horse. Even if you are having lessons back at the riding school, everything is always more enjoyable in the glorious sunshine. Most schools have multi-lingual staff, so language shouldn't be a problem. If you want to get out and about and explore, you can do this whatever your standard. For beginners, there are led walks or treks. If you are already reasonably accomplished then you'll be able to go out on hacks across the lovely Algarve countryside. Dolphin watching, Grotto trips, Deep sea fishing, River escursions, Surf lessons and many more. 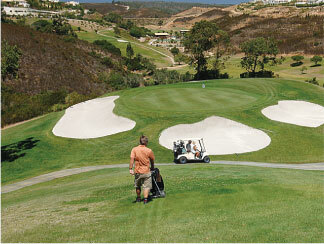 Some of the finest courses can be found in the Algarve - fit in a round or two & make your holiday complete. Browse through the courses listed in our Algarve section of this site & send us your preferences at bookings@resortrentalsalgarve.com and we will take care of your bookings.